The “Basques of the South Pacific” are participating in the ‘Korrika’…. The Insider: Ten European Cuisines in the US, including Basque! Need ideas for Spring Break? Might we recommend Soule? Like to try a piperade? Here’s a recipe for you! Although this isn’t the first time we say this, there’s no denying it: sometimes we come across information that amazes us and makes us feel a small shiver of emotion. It’s hard to imagine that the combination of the Yucatan Living website, written in English and aimed at north-American expats who live in the Mexican state of Yucatan, and retired university professor Byron Augustin, who lives in Valladolid (Mexico), could provide us with such a great story about the Basques living in this corner of America. 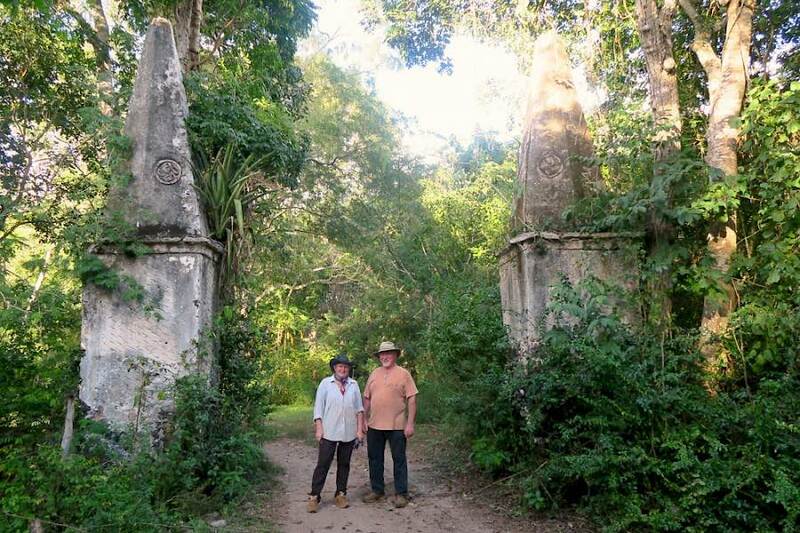 All came about at the beginning of 2015, when the author encountered a set of mysterious symbols on the main entrance of an abandoned country estate he was visiting in Yucatan: Hacienda Uxmal, which was originally built almost 350 years ago by a Basque named Lorenzo Evia. Nobody around that place, the Mayapán ruin site, was familiar with the meaning of such symbols. The professor left with the sadness of not knowing what they meant. What he didn’t imagine was that, from that moment on, they would constantly haunt him, as if they were asking him to reveal their meaning to the World. A few months later, he encountered them again at Hacienda Yaxcopoil, located in the outskirts of the city of Mérida (México). To be precise, he found them in the the old estate house, where at least six of these bizarre symbols had been carved over the doors. A while after, when discussing with some friends the enigma surrounding those signs, they told him about another place they knew where old buildings were ornamented in the same way; the posts of an abandoned country estate near Cenotillo, precisely. Even though many people would have given up on this mystery, professor Byron Augustin was determined to solve it. Therefore, he started investigating and found out many things, which are set out in a series of articles published on the Yucatan Living website. One of them is that those strange symbols were indeed lauburus, which had been brought to that part of the World by the Basque people. The work is being published in three parts, of which two have been already released. We are eager for the third one, yet we believe that the first two, which narrate his encounter with the lauburus and a brief history of the Basque people, constitute the cornerstone of the research. We can’t help but feel grateful for his research, which has enabled us to be aware of the deep connections that exist among the Basque people and that corner of Mexico. We also recommend the great selection of photographs that show these mexican lauburus. We can only complain about a small aspect of his whole, fantastic piece of research; to be precise, the reference he makes to a genetic research on the origin of the Basque people, which was published in September 2015. Indeed, this is a not-too-well founded theory that was presented before the media as an “unassailable truth” and which we discussed in an article that was widely read and quoted. But that’s only a tiny anecdote. This research unveils a fascinating chapter of Basque history we weren’t familiar with and, for that reason, we are deeply thankful to professor Byron Augustin. In Part One of this series, we set about the task of determining the origin of the ancient symbols which we have found scattered across the Yucatan Peninsula, and which we know now is calledBasque lauburu. We determined that this would require a more thorough knowledge and better understanding of the Basque people and their history. Many anthropologists and archaeologists have suggested that the Basques are older than all other European cultures. The Basques themselves have a saying that illustrates that opinion, “Before God was God and boulders were boulders, Basques were Basques.” Yet, the Basques are not well known. n Part I of this series, we embarked on a mission to discover what the ancient symbols encountered at three different Yucatán sites represented. After nearly a year of surfing the Internet, bugging friends, and checking out libraries, an art professor at the University of North Carolina finally revealed the answer. The symbol was indeed ancient and was called a Basque lauburu.